There is quite a lot of confusion amongst people about MDF. 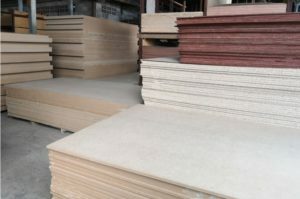 It is claimed that MDF is cheap (and thus, by implication, nasty), and that it contains toxins, that it is weaker than ‘real’ wood and will therefore break. These are almost all completely wrong: the only point with any truth is that MDF tends to be an affordable option when it comes to any project that traditionally required the use of solid wood. Medium Density Fibreboard (MDF) is made from wood fibres bound together with a synthetic ‘glue’. The fibres and the resin are mixed and then extruded in wide, long sheets before being pressed to about one-fortieth of their original height. This pressing process both strengthens the boards and ensures that there are no flaws or air-bubbles in the finished product. Formaldehyde is a natural product, an organic chemical, found in people, animals, plants and even in some foods. Formaldehyde is also a volatile compound which has been found to be carcinogenic – which means it can cause, or exacerbate the risk of getting, cancer. Formaldehyde is used in many processes, the best known of which is its use as a preservative for tissues which has seen it used for embalming and specimen-storage purposes. It is also used to help the resin and the wood fibres bind together in MDF. When MDF is cut into shelves, doors and so on, there is a small chance that formaldehyde can be released (along with wood dust and other particulate matter that make the wearing of PPE a necessity). Because of this, there have been some cases where people have claimed they were poisoned by their MDF products, but under current regulations, the amount of formaldehyde released should not be enough to cause medical issues. Extensive testing in the cases cited above, found that the levels of formaldehyde were within acceptable and legal limits. Veneered boards is an affordable and sturdy option for anyone who wants to refit the interior of their home, for businesses that want to create affordable and attractive furniture, and for anyone who wants the appearance and durability of wood without the expense and environmental implications of using real hardwood products. If you are looking for quality MDF within the Greater Manchester and North West, UK areas, Theo’s Timbers Ltd has just want you need.